The Catholic Church does not officially recognize or condone ordinations for women. In fact, it excommunicates ordained women and all who support them, claiming they are not really priests because the sacrament of ordination cannot be performed for a woman and claiming that Jesus intended only men to be ordained. In fact, Jesus of Nazareth ordained no one, and the practice of ordaining ministers developed after his death. Female priests risk excommunication to do what they believe is right. They stand in the prophetic tradition of holy obedience to Spirit’s call to change an unjust law that discriminates against women. 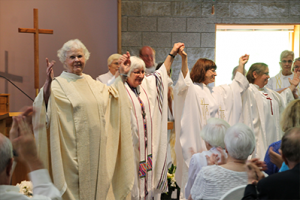 RCWP and other ordained women declare our ceremonies are valid because we follow apostolic succession—meaning that our presiding bishops can trace their sacramental lineage to the Twelve Apostles. Apostolic succession in fact has no historical validity. The supposedly unbroken line of succession from certain men chosen by Jesus to be priests and bishops is “historical fiction” (Rosemary Radford Ruether’s term), used to keep unbroken the lines of power in the institutional Church. But RCWP temporarily claims apostolic succession because it confers validity in the eyes of the Vatican and in the eyes of most Catholics. RCWP credits its founding to the Danube Seven, a group of women from Germany and Austria ordained by a male Roman Catholic bishop aboard a ship on the Danube River in 2002. They planned to be ordained on a ship because no church allowed its space to be used. Three valid bishops traveled to Passau, a little town between Bavaria and Austria, to board the ship, but only two were present at the time. The missing bishop had been deliberately locked into the room he had found for his overnight stay (Women Find a Way, 2008). A year later, two of the Danube Seven were ordained bishops and could then perform ordinations themselves. 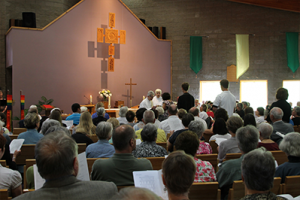 The womenpriest movement has no authoritarian structure, no celibacy requirement, no privileges for priests and bishops, and no titles such as “Mother,” or “Reverend.” Women priests and bishops support themselves, and when they are ordained, they do not promise obedience to a bishop or other religious superior, as male priests must do. They exercise a New Kind of Power. Liturgies use simple vestments and inclusive language in reference to Divinity. Pope Francis has followed his two conservative predecessors in excluding women from ordination, but the movement continues to grow, and hope for change persists. Poll findings indicate widespread Catholic support for it among theologians, lay people, and even some bishops. In December of 2012 the National Catholic Reporter endorsed the womenpriest movement, stating that “Barring women from ordination to the priesthood is an injustice that cannot be allowed to stand. “We're not doing this to be negative about Catholicism. We love this church, and that's the reason we're staying."